Like Humans, dolphins, whales, and porpoises are mammals. They are warm-blooded, breath through lungs, and give birth to live offspring; however, they also have fins like fish and live in the sea. The skeletons of these aquatic mammals have finger bones in their fins leftover from their ancestors. Some whales even have a tiny pelvis bone free-floating in their bodies, a leftover from when their ancestors had hind-legs. How did these animals, these cetaceans, whose ancestors obviously once lived on land, find their way back into the sea? Cetaceans share a common ancestor that “resembled a short, legged wolf with hoof like claws.” It is called a mesonychid, and just as Polar Bears will swim for miles across open sea to find food, or Kodiak bears will fish for salmon in rivers, the mesonychid found its way into the water, only it adapted to stay there, and we can follow the long chain of changing fossils from the mesonychid to our present-day dolphins and whales. While it’s easy to see the present resemblance between humans and other primates like chimpanzees and gorillas, it’s not so easy to explain why we became so different from them. What happened to our fur? Why do we sweat? Why do our noses look so different from chimpanzees’? Enter Elaine Morgan’s “Aquatic Ape Theory” of human evolution. The theory proposes that our ancestors spent some portion of their history living in a semi-aquatic environment. 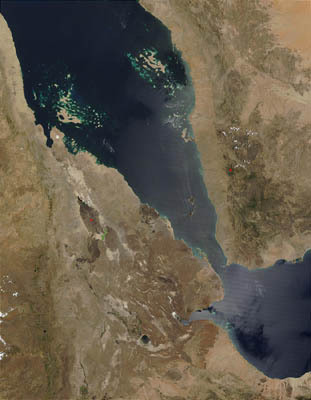 Seven million years ago, the Afar depression in Ethiopia flooded to become the Sea of Afar. The skeleton of our Australopithecus afarensis ancestor, “Lucy,” was found in this area, where she lived between 3.9 and 2.9 million years ago. Most fossilized evidence of our evolutionary ancestors comes from this region subsequent to this flooding also. So in the case of humans, we did not run to the sea, it came to us quite suddenly and catastrophically. We were thrown into the deep end of the pool, as it were, and had to adapt with down turned noses to keep the water out, less fur to streamline our bodies for swimming, eyebrows to channel the water away from our eyes, sweat glands to regulate the sudden influx of salt water in our diets, infants that can instinctually hold their breath underwater, enlarged spleens to hold oxygen-rich blood and serve as a biological “scuba-tank” that helps us hold our breath, even the ability to hold our breath, and bipedalism, the ability to walk on two feet, to help us keep our heads above water. Then the waters receded and we were left standing upright on land with much larger brains built from a diet high in fish protein. Most evolutionary theorists are skeptical of the theory; however, as the Philosopher of Biology, Daniel Dennet observes, this is not because there is any way to prove the theory wrong, only that it seems too “out there” to be plausible. They hold to the “Savannah Ape” theory, which proposes that humans became bipedal running across the open plains and using tools. Meanwhile, waterfront properties garner the biggest real estate values in human society. Beaches are among the most popular vacationing spots in the world (unlike savannahs). Eating fatty fish, such as mackerel, lake trout, herring, sardines, albacore tuna and salmon, supplies our bodies with omega-3 fatty acids, which help fight heart disease and depression. Scientists are also learning more and more that fish really is a “brain food,” combating mental deterioration in old age. Perhaps, when we spend a relaxing afternoon fishing, we are getting closer to our true nature than we think? 1) Mio- & Pliocene apes (Helio-, Austriaco-, Oreopithecus etc.) & australopiths typically lived in mangrove or swamp forests & wetlands, feeding partly on aquatic foods, like lowland gorillas still do one or two hours per day. Google “aquarboreal”. 2) Pleistocene Homo spread along coasts as far as Java (Mojokerto, Flores), England (Pakefield, Boxgrove) & the Cape, and from the coasts inland along rivers & lakes, in savannas & elsewhere. Google “econiche Homo”.